Error: Error validating access token: Session has expired on Wednesday, 20-Mar-19 00:35:59 PDT. The current time is Saturday, 20-Apr-19 15:08:33 PDT. 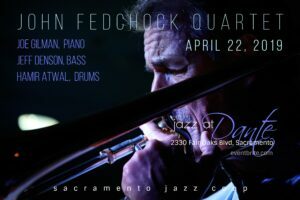 The mission of the Sacramento Jazz Cooperative (SJC) is to ensure the preservation, and to foster a greater understanding of jazz as the true American art form. Objectives include increasing audience participation of all ages through education and performance.